The summer is typically hot and dry. Too hot to do any gardening for prolonged periods. Some people love the long, lazy days of August. For the rest of us, though, the cooler air of September is perfect weather to get out in the garden and the yard. This beautiful season does come with some time pressure, of course! Homeowners have but one chance to successfully manage their gardens before cold winter weather hits. It’s best to set up a maintenance checklist. Watering – Ensuring your plants and trees have adequate water is crucial. The roots of each plant must have plenty of moisture for the upcoming months. Bulb Shopping – Whether you choose to order from catalogs or brick-and-mortar shops, shopping for bulbs is ideal this time of year. Clear Debris – Over time, debris from fallen foliage may accumulate throughout your garden. This debris may spread disease that kills flowers and plants. Clear it all out. 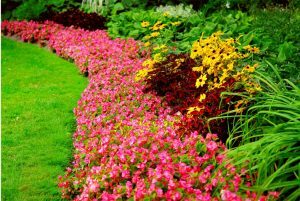 Fall Annuals – Once summer fades, add some color to your garden with a selection of fall annuals. Annuals include mums, pansies, and ornamental kale, for example. In addition to planting new bulbs, fall is the time of year when we may rework mulch beds and fertilize the soil. The biggest fall gardening tip we can offer: Call Blooms Landcare for professional lawn care services at (817) 688-5352. We’re happy to help make your garden brighter and more full of life!